There are probably a few people out there who think musicals are silly but personally I enjoy going to see them. They transport you to a world of make believe, a world where people burst into song and sound great, full of colour and light and usually a happy ending rousing finale that makes you walk out with a big smile on your face, thinking that maybe the world is a better place than you thought. 1. The Lion King – I saw this with my family and was disappointed. The cast at that time weren’t that great and I just didn’t get a great feeling watching it. Shame because the film is great! 2. My Fair Lady – I went to see this hoping to see the lead actress but she was sick and I got the understudy so that was a shame but it was a good solid production. 3. 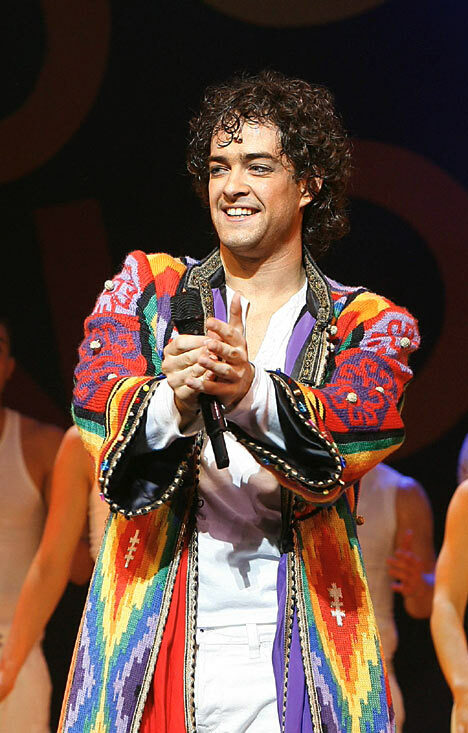 Joseph – I went to the new version of this after the BBC reality show and watched the winner Lee Mead – the show was fun and colourful and he was great in it. Well worth seeing. 4. The Woman in White – A new Andrew Lloyd Webber production which closed really quickly. I actually enjoyed it – it was powerful and dramatic with a great mystery story line and some beautiful music. 5. 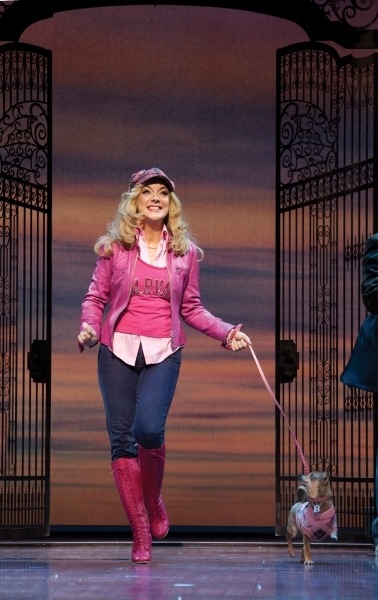 Legally Blonde – this show is brilliant! It’s just lots of good cheesy fun and we were all on our feet at the end. I’d definitely watch it again. 6. The Sound of Music – I went to see this again after a BBC show to find the lead but by this time she had left and someone from a soap was in it. The production was slick and professional and I really enjoyed it. 7. Grease – hideous. Nothing like the film. Don’t bother watching this! 8. 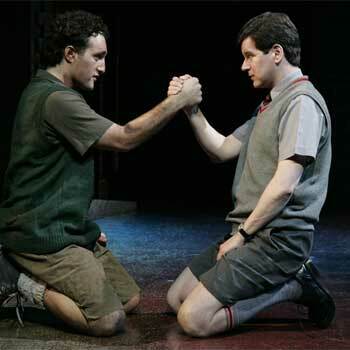 Blood Brothers – a great story, powerful and moving and pretty sad. Overall music not as good as the story but a strong end song so all is forgiven. What’s been the best musical you’ve seen? I saw Jesus Christ Superstar in the 70’s . . . awesome! I think that my all time favorite was “The King & I”…but I’ve also loved “Phantom of the Opera”, “Annie” & “Miss Saigon” etc. I’d love to see “The Sound of Music” It is my all time favorite movie!! It’s a great one to watch at Xmas! I hope you do get to see it live one day! No I haven’t I need to check it out! The best musical I have seen is Sweeney Todd. I saw it before the Johnny Depp film and was therefore disappointed with the adaptation. One musical that I was disappointed with was Les Miserables. The acting was really good, but the overall story didn’t do it for me. Maybe I went into it with too high hopes. I haven’t see either but I do like “I dreamed a dream” and “On my own” from Les Mis. I haven’t seen many non-Disney musicals, but Fiddler on the Roof is my favorite of those I’ve seen. It’s the only one I actually own. Ba.D., on the other hand, is a huge fan of musicals. He’s got a dozen at our house and bunches more back at his mom’s house. I love musicals, they remind me of a simpler time. I still hear the song, “Two for tea” from No, No Nanette playing in my head every so often. But I haven’t been in a while. Yeah I agree, if only real life was like a musical! I feel sad…I have never seen a musical…now I want to …hmmm…who will take me? Ah poor you, you should def try and go! 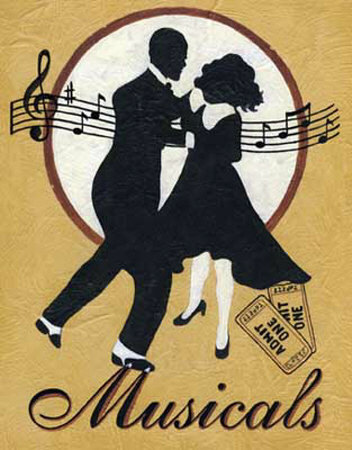 I love musicals! Other than High School productions I’ve never only seen one on Stage but I was a part of School House Rock live and Sound of Music in High School and Then my High School did Seven Brides for Seven Brothers and Little Shop of Horrors which were both amazing! Last fall I also got the chance to see Little Shop done by my college. I do very much enjoy watching Movie Musicals though! My favorites being Sweeney Todd, Hairspray, Phantom of the Opera, Chicago, Sound of Music, and Moulin Rouge. And of course, all the classic Disney movies are musicals as well! 🙂 Musicals are the best! Disney ones are def the best! Maybe I just didn’t see a good cast. Not seen that one but a film version is on its way! Musicals are the best!! I saw Lion King too… the animal puppets were amazing, but I’m actually not a huge fan of the movie/musical (Blasphemy, I know.). I was lucky to see more than a fair few shows on Broadway. Of the musicals my sister and I saw, the revival of Sweeney Todd was stellar (we were close enough to get spat on by Patti LuPone… it was epic). One of the funniest musicals we saw was The 25th Annual Putnam County Spelling Bee 🙂 Also, Company was brilliant… I actually cried during the final song because it was so moving. I would commit heinous acts to be in a movie or stage musical some day. I was in Oliver Twist and Joseph & The Amazing Technicolor Dream Coat so both of those are near and dear to my heart. I also love Les Mis, Fiddler On The Roof, and My Fair Lady with a passion. Brilliant! That sounds fun, I’m jealous! Good picks! I’ve only seen Phantom of the Opera a loooooooong time ago but am desperate to see Legally Blonde and Jersey Boys! You should def see LB, so much fun and my mum love JB so both should be worth a watch! Ah a classic, glad you enjoyed it! Haha happens to us all! I live Defying Gravity great song!